The city of Hebron, approximately 20 miles south of Jerusalem in the Judean Hills, has been linked to the Jewish people from time immemorial. It is, after Jerusalem, the most sacred city for the Jewish people. 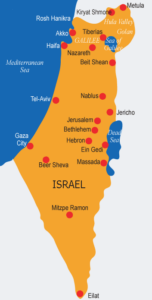 Today, adjacent to the larger Arab population of the city, approximately 1,000 Jews, live in four small neighborhoods Avraham Avinu, Beit Hadassah, Tel Romano and a region above Tel Rumeida where caravans are located. The population is comprised of some 100 families, as well as 250 students studying at the Yeshivat Shavei Hevron in Tel Romano. 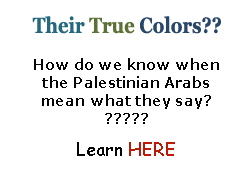 In August 2017, Defense Minister Avigdor Lieberman upgraded the status of the Jewish area, so that it is now its own municipality, and not simply part of the larger Arab municipality. 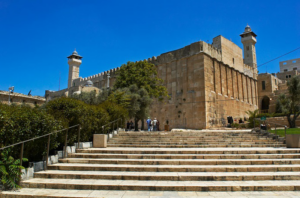 Within Hebron, in the Jewish area, is the Cave of Machpela, the Tomb of the Patriarchs—an exceedingly ancient site of considerable religious significance to Jews. Immediately to the east of Hebron is the modern Jewish municipality of Kiryat Arba; founded in 1971, it now boasts 6,500 residents and provides services – schools, stores, clinics – upon which the Jewish residents of Hebron rely. Hebron—sometimes referred to as Mamre, and sometimes as Kiryat Arba—is mentioned 78 times in the Hebrew Bible. 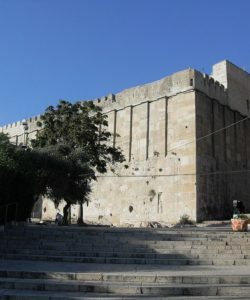 The Jewish connection to this ancient city begins with Abraham: After entering Caanan some 3,700 years ago, he came to live in Hebron, which is where he learned of God’s promise of the land to his seed. When his wife Sarah died, he purchased a family burial cave and surrounding field in Hebron from Ephron the Hittite for 400 measures of silver. That burial cave is the Cave of Machpela, where all of the matriarchs, save Rachel, and all of the patriarchs are buried. Three thousand years ago, David was anointed king of Israel in Hebron, and ruled from there for seven years before making Jerusalem his capital. 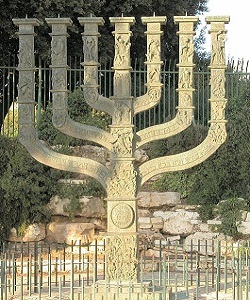 After the destruction of the First Temple, many, but not all, Jews were exiled. Judah Maccabee did battle here in the 2nd century BCE and Hebron again became a Jewish city. 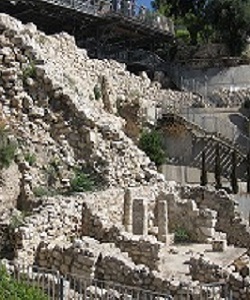 Subsequently, King Herod built the structure that stands atop the actual caves to this day. After the destruction of the Second Temple, Jews continued to live in Hebron and to pray at the Machpela. In the two millennia since, what we see is a pattern of holding fast to the city, so that every time there has been enforced exile, with only a remnant remaining, there has been return and re-establishment of community – community that during some periods flourished. 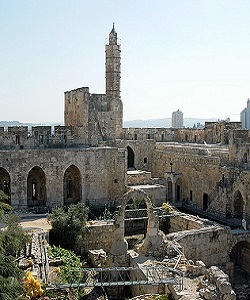 The Byzantines, in the 6th century, made a church of the Machpelah; yet Jews continued to live in Hebron, and there is evidence that a Jewish community was maintained during subsequent Arab conquests. During the period of Crusader conquest, 12th and 13th century, Jews were again exiled, but returned to establish a community under the Muslim Mamluks, 13th to 16th century. Seven hundred years ago, the Mamluks decreed that Jews were forbidden to enter the Machpelah, which was functioning as a mosque. The edict that Jews were restricted to the infamous seventh step of the entrance was in force until the 20th century. And still Jews lived there, and prayed from that seventh step. At the end of the 15th century and into the early 16th century, Sephardi Jews expelled from Spain and then Portugal made their way to Hebron. By this point the Ottomans had assumed control of the area. Purchasing large tracts of land, the Sephardi Jews established a vibrant community that was sustained – in spite of periods marked by pogroms – for some 400 years. 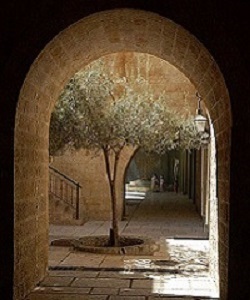 In 1540, the Sephardi rabbi Malkiel Ashkenazi became Hebron’s rabbi and halakhic expert; he acquired a courtyard that became the heart of the Jewish Quarter, and established the Avraham Avinu synagogue, which was housed in a magnificent building. In the late 16th and early 17th centuries, well known Kabbalist mystics from Sfat moved to Hebron, bringing their teachings with them. The late 17th and early 18th century saw difficult times, with blood libels, expulsion decrees, and poverty. Of considerable significance for the community was the arrival of Ashkenazi Jews including Lubavitch Hassidim. 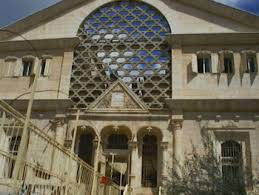 Maintaining a close relationship with the Sephardi community, they assisted in strengthening communal institutions; an Ashkenazi synagogue was constructed near the Avraham Avinu Synagogue. The fortunes of the community improved in the 19th century, with considerable support from philanthropists such as Sir Moses Montefiore. 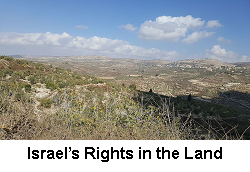 By the early 1800s, the Jews had acquired by purchase and lease over 800 dunams of land. Religious scholars strengthened the spiritual life of the community as well. In 1879, Haim Yisrael Romano, a wealthy Turkish Jew, venturing beyond the old Jewish Quarter, built an elegant and spacious home known as Beit Romano, which he utilized as his family residence and a hospitality center for visiting Turkish Jews; it also incorporated a synagogue, the Istanbuli Synagogue. In 1893, a one-story building called Hesed l’Avraham – which provided assistance to the needy, Jewish and Arab – was established by wealthy North African Jews. In 1909 the building was expanded and a clinic established. As Hadassah, the Women’s Zionist Organization, contributed the salaries of the medical staff, the building became known as Beit Hadassah..
World War I brought hard times to Hebron and severe decline in the Jewish community. Once Britain acquired the area at the end of the war, as part of the Mandate for Palestine, the community again began to flourish. Support for education was provided by Zionist organizations, and in 1925, the renowned Yeshiva of Slobodka was moved from Lithuania to Hebron. Destruction came to the Jewish community of Hebron in 1929, with Arab riots. While relations between Jews and Arabs in the area had not always been placid, there was an extended period prior to these riots that had seen peaceful co-existence. The violence was instigated by the Haj Amin al-Husseini, the Mufti of Jerusalem, who later became an active supporter of the Nazis (and was a relative of and mentor to Yasser Arafat). The Mufti’s goal, quite simply, was the elimination of the Jewish community of Hebron. To that end he instigated and made false charges. The Arab rioting began following inflammatory sermons and went on for hours, with the indiscriminate slaughter of women, children and the aged. The rioters, wielding weapons, went from house to house, crying “Kill the Jews.” Sixty-seven people were murdered, many were maimed. The Chief Sephardic Rabbi of Hebron, Rabbi Hanoch Hasson, was slaughtered together with his entire family. Ben-Zion Gershon, the pharmacist at the Beit Hadassah Clinic, who had extended professional assistance to Arabs, was tortured; his wife’s hands were cut off and she died in anguish. Synagogues were razed and Torah scrolls burned. The British made no move to stop the riot. But three days later, after funerals had been conducted, they decided to evacuate the survivors. They were loaded on to trucks and brought to Jerusalem, while all property and possessions were left behind. 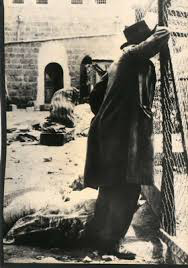 In 1931, 35 families attempted to rebuild the Jewish community of Hebron; among them was the elderly Rabbi Yaakov Yosef Slonim, who had lost his entire family in the riots. But in 1936, new riots broke out. Once again, the British, instead of defending the Jewish community, decided that to “maintain calm” they would transport the Jews out of Hebron. Thus was this most ancient of Jewish communities temporarily vanquished. 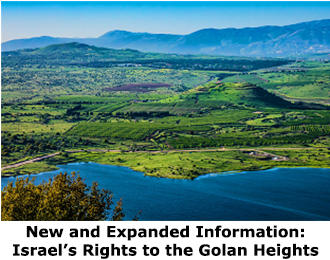 For the first time in over 3,000 years, there was no remnant community, no Jewish presence. Not until 1968 would there again be a Jewish presence in Hebron. In 1948, during the Israeli War of Independence, the Jordanians secured control of Hebron, along with all of Judea, and held it for 19 years. 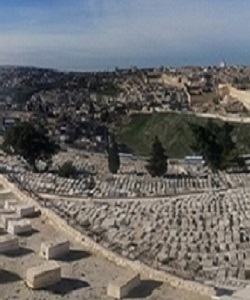 They forbid Jews to live or worship there; razed the Jewish quarter; built an animal pen on the ruins of Avraham Avinu Synagogue; and desecrated the cemetery. Israel gained control of Judea-Samaria during the Six Day War in June 1967. 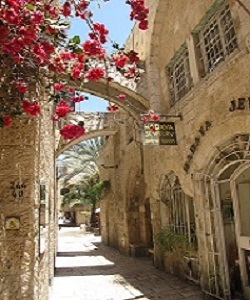 Hebron, although devoid of a Jewish population, was again in Jewish hands. In April 1968, Rabbi Moshe Levinger and a group of like-minded religious Jews decided it was time to re-establish the Jewish community in Hebron. They began by renting the Park Hotel in Hebron from its Arab owners for an indefinite period of time. When the call went out, 86 people came together in the hotel for Pesach seder. Two days later, the rabbi called a press conference and declared intentions to remain in the hotel. This met with resistance from Arab Hebron, as well as from the government of Levi Eshkol, which was not enthusiastic about what was intended. Moshe Dayan, then Defense Minister, gave the group a choice: Be forcibly removed, or go live in the nearby military compound that had become military headquarters for Judea. The group lived in that compound for two and a half years, awaiting construction of the first neighborhood in Kiryat Arba, a new Jewish community that was to be set up adjacent to old Hebron. But while the establishment of Kiryat Arba constituted a success of sorts, it was not sufficient. Still there was the longing to return to the old city of Hebron. In 1979, a group of 10 brave women and their 40 children made their way into the basement of the old clinic, Beit Hadassah, in the middle of the night. Their presence, discovered in the morning, caused a furor. Prime Minister Menachem Begin did not try to force them out but instead ordered that the building be surrounded and that nothing be allowed in. 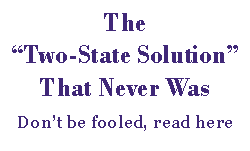 He relented when Rabbi Levinger reminded him that even enemy Egyptian soldiers under siege were given food and water. For two months, those inside the building lived under siege. 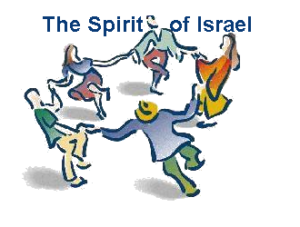 Each Friday night, worshippers who lived in Kiryat Arba would come outside Beit Hadassah and sing and dance. On a Friday night in May 1980, terrorists attacked, killing six and wounding 20. The Israeli government then relented and gave permission for Jewish resettlement in Hebron. Beit Hadassah was refurbished and residence was permitted in nearby buildings. Over time other buildings were refurbished and became places of residence for Jews. 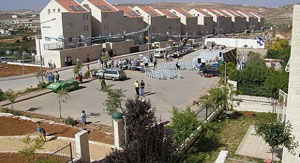 After 1980, a Hebron Municipal Committee, established by the government, assumed administrative responsibilities for the Jewish community, and the Ministry of Housing set up the Association for the Renewal of the Jewish Community in Hebron to carry out projects. A subsequent special arrangement with regard to Hebron—the Protocol Concerning Withdrawal in Hebron—was signed by Prime Minister Binyamin Netanyahu and Yasser Arafat in 1997. 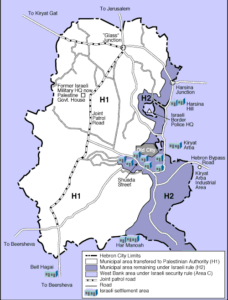 It required the IDF to withdrawal from 80% of Hebron by 1998, with division of the city into H-1, under full control by the Palestinian Authority (and Hebron Arab municipal authority) and H-2, with full control Israeli control. 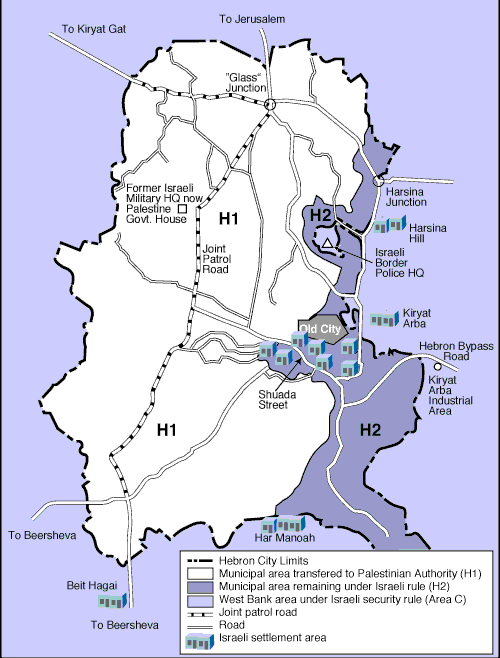 H-2 is a contiguous area to the east and south-east of the city, and incorporates the old Jewish neighborhoods of Hebron as well as the Machpela. The IDF was given full responsibility for security of Hebron’s Jewish community. Responsibility for security at the Cave of Machpela was also allocated to the IDF. A procedure was set in place that provided for complete separation of Jews and Muslims worshipping inside the Machpela, with 10 religious days for each group on which they would have exclusive access. Residents of Hebron warned of the dangers inherent in Palestinian of control of Abu Sneinah, which was adjacent to the Jewish area and provided a high point for shooting at the Israeli population. Unfortunately, these warnings were prescient: On March 26, 2001, Shalhevet Pass, 10 months old, was fatally shot in the head by a sniper positioned on a hill at Abu Sneinah; the baby was buried in the ancient Jewish cemetery of Hebron. Since Operation Defensive Shield in the spring of 2002, the IDF has patrolled in the Palestinian areas of Hebron, and has set up permanent stations on the high ground overlooking the Jewish area and the adjacent highway. While the Palestinian Arab population was jubilant at Israeli withdrawal from the major part of Hebron, the Jewish residents, and those supporting them, were deeply concerned. Hebron was being portrayed as an “Arab” city, which by sufferance is tolerating a small minority of Jews who are “radical settlers” and a thorn in the side of the Arab majority. 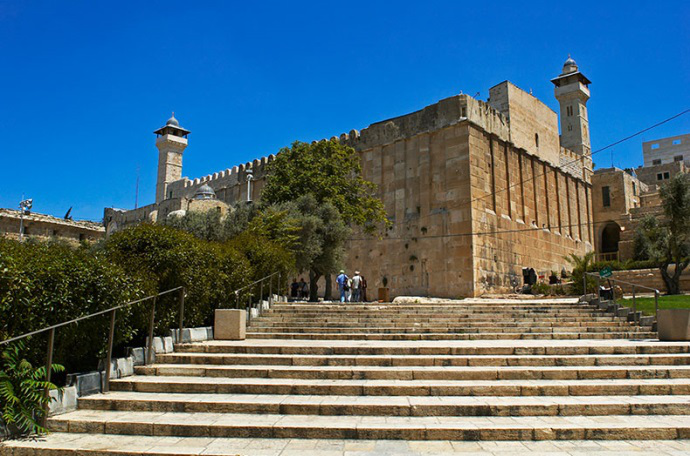 The fact that Hebron was the first of Jewish cities and has a long and deep connection to the Jewish people is either denigrated or ignored. The readiness of various Israeli governments to deny Jews their rights to remain in ancient Jewish areas has been painful to witness and frequently baffled understanding. 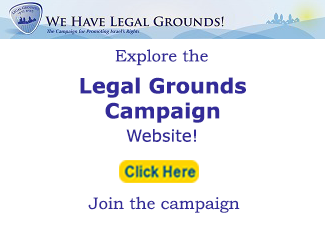 There have been a series of legal battles, as residents have sought their rights to purchase and live in buildings in the Israeli-controlled area. There have been legal issues with regard to Mitzpe Shalhevet, Beit Shapira, and Beit Hashalom (pictured), which is now thoroughly refurbished as a Jewish building. To live in Hebron is not an easy thing to do. 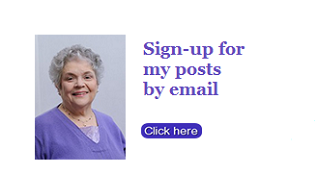 Yet there is a solid core of dedicated residents who are deeply devoted to remaining. 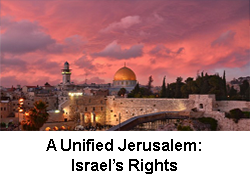 Their dream is to ensure forever the right of Jews to have access to this ancient city of sanctity and to live again in areas that have been Jewish for millennia. These good and courageous people are making the effort on behalf of all Jews, and work in the service of the Almighty. All who care about Jewish heritage owe them a great debt of gratitude. Former Hebron spokesman David Wilder wrote about visitors to Hebron who spoke with the Arab mayor, Mustepha Natsche. Were Jews allowed to pray at the Cave of the Machpela? they asked. “No,” he replied, “it is a mosque and only Muslims may pray at a mosque.” Other Muslims have reiterated the same attitude. It is thus quite clear that without a Jewish presence in Hebron, ultimately the second holiest site in Judaism would be closed to the Jewish people. To the residents of Hebron, this would be to abandon the Mothers and the Fathers, and this is simply unthinkable. What is more, abandonment by Israel of this holy site would be a precursor to further abandonment, as a precedent would have been set. If the Cave of Machpela, why not also Har HaBayit (the Temple Mount)? If Hebron, with its ancient links to Judaism were to be surrendered as a Muslim city, it would become easier to then surrender eastern Jerusalem, with its large Arab population, in spite of the ancient links of that area to Jewish tradition.